It takes more than filling out a simple application to board your pet at Canine Kindergarten. At this doggie daycare center, pets–and their owners–go through an elaborate interview process. WSJ’s Monika Vosough reports from Verplanck, New York. Finally, the family left Cannoli at the day care for another three hours to make sure he would adjust to the new environment and playmates. She was right. Cannoli passed, becoming the newest “camper,” as they’re called at Camp Bow Wow. 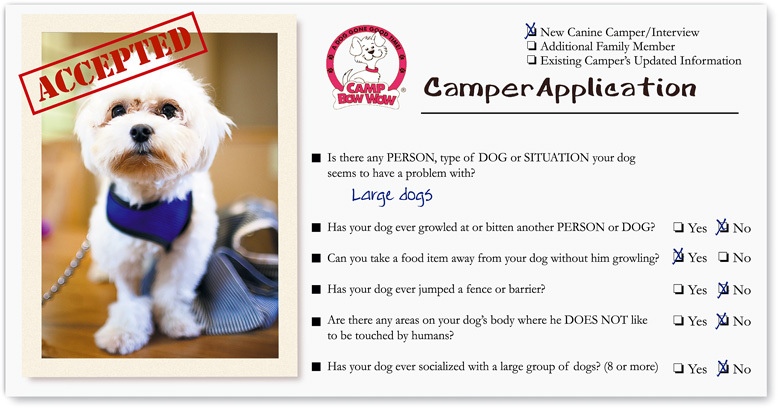 Interviewing and evaluating campers is one way to lower risk in a dog-eat-dog world, says Heidi Ganahl, founder and chief executive of Camp Bow Wow, with 110 camps in the U.S. “Screening the pups assures us the dogs are good candidates for our all-day play environment and [that they] will be able to play safely,” she said. 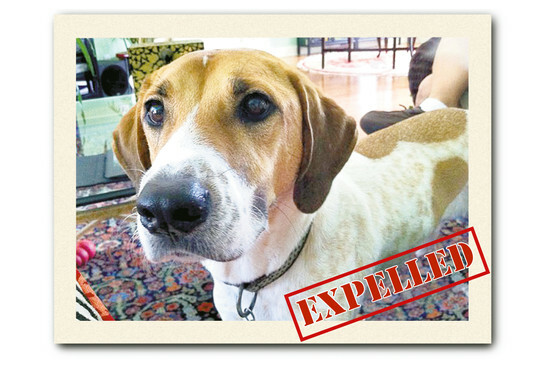 Henry was kicked out of a Naples, Fla., day care for aggressiveness. But he was accepted at another facility and took obedience classes. At Camp Bow Wow, dogs are separated by size. Some day cares, such as Virginia Woof in Portland, Ore., and Wagville in Los Angeles, consider temperament and activity level in addition to the dogs’ sizes. “We generally don’t put dogs smaller than under 25 pounds with the bigger dogs. But sometimes we put big dogs that are old or timid with the little ones,” says Julie Shine, owner of Wagville, which has an eight-page application form. Doggie day cares started popping up in the early 1990s, Ms. Ganahl said, and now number in the thousands. Many started out as kennels, boarding dogs when their owners were away. On a recent summer morning, Cannoli, the seven-pound Maltese shown here, had to wow evaluators at Camp Bow Wow in Long Island City, N.Y., in hopes of being accepted at the doggie day care. Describe dog’s normal socialization with people and with dogs (e.g. Goes to dog park once a week; Always alone at home; etc.). If they go to the dog park, please tell us how they act at the dog park. Are there any places your dog does not like to be touched, during grooming or otherwise? What are your favorite things about your dog? Is there any PERSON, type of DOG, or SITUATION your dog seems uncomfortable with? Can you take a food item away from your dog without him growling? Has your dog ever jumped a fence or barrier? Has your dog ever played with dogs over 15 pounds? Has your dog ever played with dogs under 15 pounds? A full, eight-hour day of day care usually costs between $25 and $32, while overnight boarding can range from $35 to $55. Only a small fraction of dogs—from 5% to 10%—are rejected from day care, usually because they’re aggressive, territorial or very uncomfortable interacting with other dogs, day-care operators say. “When we reject aggressive dogs, the owners normally say, ‘We figured,’ Mr. Neagus says. Also, most day cares require that dogs older than six months be spayed or neutered. Shortly afterward, however, Henry was accepted at a Camp Bow Wow located in Naples. The camp counselors suggested that he be enrolled in a five- to six-week basic obedience-training class, advice that Mr. Sprowls and his wife, Robin, followed. They also started walking him every day and took him to outdoor fairs and dog parks. Henry still goes to camp at least twice a week. “Now, he plays just fine with other dogs,” Mr. Sprowls says. 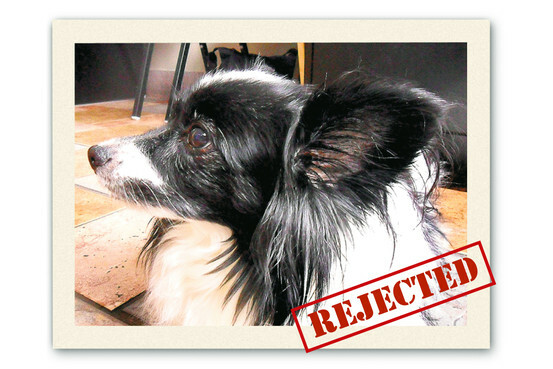 Timidity, nervousness and stress kept Rita, a 13-year-old Papillon, out of Virginia Woof, the Portland, Ore., day care. Complicating the process: Lorraine Smith, Rita’s owner, is the manager of Virginia Woof. Many day cares allow dogs that appear to be too timid or nervous during the evaluation period to come back once or twice to see if they fare any better. Some centers recommend that the dogs try smaller day cares or dog parks, where they can interact in smaller groups in order to get used to hanging around in a pack. Christine Anderson, owner of Wag the Dog, another Portland, Ore., day care, believes in giving “bad dogs” some leeway. Each dog can get three timeouts—a three-minute period in which dogs are taken out of the play area and put into single kennels. “Everyone can have a bad day. Sometimes the poor behavior—like playing too rough—can be because the dog is too tired or not quite understanding what his friends want,” she says. After three strikes, they’re kicked out of day care. “Outside training can help, but aggression is something that can be managed, not cured,” Ms. Anderson says. The owners’ personality has a lot to do with a dog’s behavior, day-care owners say. « You know how difficult a time I have steering a canoe! ?